Angel trumpet is a poisonous flowering plant, though it is only toxic when large amounts are consumed. The plant reaches as high as 15 feet at full maturity and, without pruning, it will reach up to 15 feet wide. 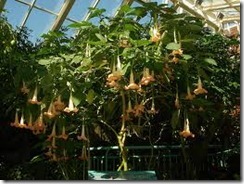 Angel trumpet acts as a small tree or large shrub with long, trumpet-shaped flowers growing in pink, yellow or white. Grow angel trumpet in U.S. Department of Agriculture Plant Hardiness Zones 10 through 12 for best results. Prune angel trumpet to keep the growth tight and neat, minimizing the size of the plant. Watch the plant, waiting until it begins to grow in a "Y" shape. The distinct shape is a sign that the angel’s trumpet plant is mature and ready for regular pruning. Locate old growth that is more than a year old. Look for thick stems that are wide in diameter and show signs of cracking or age. All but the newest stems and shoots of the angel trumpet plant should be pruned away. Make cuts as close to the base of the stem as possible, getting right next to the trunk of the plant, using sharp garden shears. Prune lateral branches to make the plant bushier, making cuts just at the joint of branches. Search for any suckers, which are skinny branches growing straight up from the base and trunk of the plant, and cut them back to the base. Cut away all branches growing within 1/2 inch of the ground. Search for any branches that seem to be crowding other branches, thinning out areas that look too crowded. Always keep the healthiest-looking branches when choosing what to prune. Prune angel trumpet plants lightly; remove only 1/8 of the total leaves of the plant in one pruning session.